Each time a visitor submits one of your forms, we’ll send the data over to your ConnectWise system with the ability to create new Contacts, Companies, Opportunities, Activities and Service Tickets. The integration is an add-on to the forms you already have on your website. This means nothing about the existing functionality will be lost or changed. Only more goodness. Each form can have different ConnectWise settings configurations. For example, one could create a service ticket, another create an opportunity assigned to John, another create and opportunity assigned to Jane and so on. Screenshot from the ConnectWise mapping details settings. 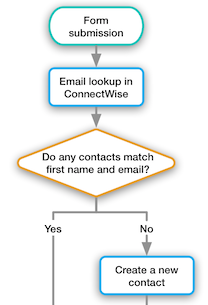 Click on the image below to see exactly how the logic flow works each time a form is submitted. The Pronto team is standing by to help implement and troubleshoot any issues you have. You’re also free to add or update any settings yourself. If you’d like to do so, you can find a guide here. ConnectWise Forms Integration is a free service for Pronto clients. Do I need to change the forms currently on my website? Nope! 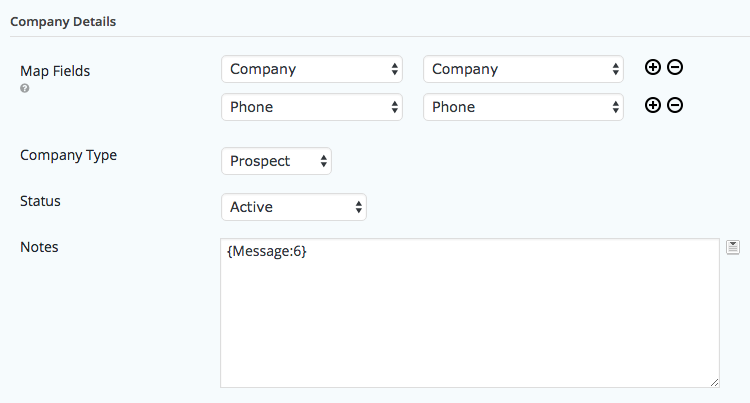 This is an add on that integrates with the forms you already have setup. You can keep all of the existing settings and notifications currently configured. The only thing that you might want to change on some forms is if they don’t ask for a different first and last name. ConnectWise requires these to be sent as two separate values. Can I edit the form and integration settings myself? Of course! This is easy for you to do once logged into your WordPress dashboard. Here's a guide that explains how the integration works and how to set things up yourself.